RETIRED Full Size Whiffer Sniffers Super Sniffer Series 1 Bubbles Bubble Gum!!! NWT GRATEFUL DEAD BEANIE BEAR. one of the "grate" bears from the Grateful Dead. Is long retired, very desirable. I will try to make it right. Just perfect for your collection or give as a gift. EXCELLENT CONDITION.WOULD MAKE GREAT GIFT/PRESENT. RED Bear - Steven Smith. What you see is exactly what you will receive. L@@K SWEET NWT COLLECTIBLE NEW PLUSH Grateful Dead Bean Bear "ALOHA". NWT GRATEFUL DEAD BEANIE BEAR. one of the "grate" bears from the Grateful Dead. Is long retired, very desirable. Just perfect for your collection or give as a gift. L@@K SWEET NWT COLLECTIBLE NEW PLUSH Grateful Dead Bean Bear "PICASSO MOON". "PICASSO MOON". NWT GRATEFUL DEAD BEANIE BEAR. one of the "grate" bears from the Grateful Dead. Is long retired, very desirable. L@@K SWEET NWT COLLECTIBLE PLUSH Grateful Dead Bean Bear "JACK ROE". "JACK A ROE". NWT GRATEFUL DEAD BEANIE BEAR. one of the "grate" bears from the Grateful Dead. Is long retired, very desirable. Grateful Dead Bean Bear Turtle Stealie Stuffed Toy Plush Doll Japan new . If a conversion adapter can handle the electric power, all you need to do to use the product in your country is to change the plug to type A. The plug type in Japan is type A. All Japanese electric machineries operate at 95V-105 V (50Hz-60 Hz). This is the 7" Grateful Dead Bean Bear, Snowflake. She was one of the Fourth Edition of Grateful Dead Bean Bears that was retired on May, 2002 with a total production number of 60,262. GRATEFUL DEAD BEAN BEAR SNOWFLAKE. This is the 7"Grateful Dead Bean Bear, Dupree. He was one of the Second Edition of Grateful Dead Bean Bears that was retired in October, 1999 with a total production number of 106,080. GRATEFUL DEAD BEAN BEAR DUPREE RETIRED OCTOBER, 1999. This is the 7"Grateful Dead Bean Bear, Franklin. He was one of the Second Edition of Grateful Dead Bean Bears that was retired in March, 1999 with a total production number of 106,464. GRATEFUL DEAD BEAN BEAR FRANKLIN RETIRED MARCH, 1999. This is the 7" Limited/Special Edition Grateful Dead Bean Bear, Poppa Bear. He was a Limited Edition Grateful Dead Bean Bear that was retired in November, 1999 with a total production number of 25,000. L@@K SWEET NWT COLLECTIBLE NEW PLUSH Grateful Dead Bean Bear "UNCLE JOHN". NWT GRATEFUL DEAD BEANIE BEAR. one of the "grate" bears from the Grateful Dead. Is long retired, very desirable. "UNCLE JOHN". L@@K SWEET NWT COLLECTIBLE PLUSH Grateful Dead Bean Bear "DAISY". NWT GRATEFUL DEAD BEANIE BEAR. one of the "grate" bears from the Grateful Dead. Is long retired, very desirable. I will try to make it right. New Items come from a warehouse sale, imperfections will be listed. I do not accept returns. First few photos are stock, All others are of actual item No tags or no orignnal packaging Line through brand name to deter from returning to store. ALL items are inspected before we ship your order. Payment is expected immediately after close of auction. Shipping and handling is FREE within the continental USA. All items come from a smoke and pet free home. Original made in Japan 2001. Don't Miss the Rare item. A must have for the avid collector or fan. Grateful Bear, Steven Smith Stuffed Animals inc, Brooklyn NY. A Liquid Blue Production (c)1990 G.D.M. inc. Arms/legs/head seem to be jointed and movable. Condition is "used" only because the original bag is gone. Vintage Grateful Dead Beanie Bears 1997-98 Lot of 5 Liquid Blue by Steven Smith. Condition is Used. Shipped with USPS First Class Package. GRATEFUL DEAD BEAR. LIQUID BLUE. Perfect For Every DEAD HEAD. Also, this bear is not Liquid Blue its Steven Smith and the pellets are PVC also a sign of 1st edition. 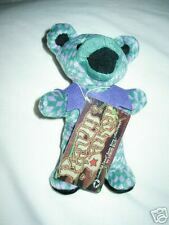 FALL TOUR Grateful Dead Bean Bear By Liquid Blue 1999 FREE SHIPPING. Condition is Used. Shipped with USPS. GREAT CONDITION Tag on his bottom is missing. FREE SHIPPING US BIDDERS ONLY Any questions, please ask before bidding. Ty Beanie Babys. Date Of Birth 5-21-94. Hard to find JOINTED Grateful Dead Black and White spotted Teddy Bear by Steven Smith from the 1990's. Approx 13" tall including ears when standing, or can sit. Jointed moveable arms and legs. The green band can be removed but is held in by stitching on the back of neck (manufactured that way). 1998 Grateful Dead Dupree Bean Bear Plush Collectible By Liquid Blue NWT. Condition is New. no holes or stains. PEARLY BAKER. GRATEFUL DEAD COLLECTIBLE BEAR. BY LIQUID BLUE. SEE PICTURES FOR DETAILS. Grateful Dead Candy Man W/ Tag Bean Bear 1991 Tour Liquid Blue Dancing . Condition is Used. Shipped with USPS First Class Package. EARLIEST WINNER WILL GET LOWEST NUMBERS. BEARS ARE LIMITED TO 20000 FOR MARDIGRAS FROM 2001 AND 25000 FOR POPPA BEAR FROM 1999. The Grateful Dead is a renowned and beloved American rock band, and the groups music and legendary shows have gained a large following since the band came to the music scene in the mid-1960s. The colourful dancing bears that are still commonly seen serve as a testament to the bands widespread appeal. A beanbag plush dancing bear is a common collector's item for Grateful Dead fans, also known as Deadheads, and is an iconic symbol of the band. What is the meaning of the Grateful Dead bears? The dancing bears are seen in many colours, patterns, and designs, creating a symbol of the individuality, strength, freedom, happiness, and carefree culture surrounding the Grateful Dead and the music they share. The Dead Bears are said to also represent Owsley Stanley, an LSD chemist and sound engineer for the band who was nicknamed Bear for his hairy appearance. Where did the Grateful Dead bear originate? The marching bears were designed by band and team members, and they first made an appearance as part of the artwork of the back cover of the 1970 album release of History of the Grateful Dead, Volume 1: Bear's Choice. It is said that the inspiration for this artwork came from an emblem on an old font box. The bear emblem quickly became a popular symbol of the band and is still widely known. What is a beanbag plushie? A beanbag plushie is a small, soft toy that is stuffed with a combination of artificial cotton, also known as fiberfill, and many pellet-sized plastic beans. These Dead Bears come in many different colours and designs and names like Jerry, Ripple, and Franklin. Who drew the Grateful Dead bears? Graphic artist and musician Bob Thomas drew the bears with design input from band team member Owsley Stanley. Thomas was a good friend of the band and created many other pieces of art that have also become famous icons for the Grateful Dead. What are the Grateful Dead bears called? While the iconic symbol does not have an official name like some of the other Grateful Dead logos, these Dead Bears are commonly referred to as the dancing bears. However, as stated by Owsley Stanley, the bears were actually created to be marching as opposed to dancing. What was the original name of the Grateful Dead? When the band was first formed by Jerry Garcia and a couple other members in 1962, they performed under the name of Mother McCree's Uptown Jug Champions. The name was soon changed to The Warlocks in 1965 before finally becoming the Grateful Dead later that same year. Jerry Garcia founded the name when reading a piece of folklore in a dictionary. Is the Grateful Dead band still together? Many of the members of the Grateful Dead, including Jerry Garcia, have passed away. Following Garcia's death in 1995, the remaining band members split but have come back together on numerous occasions to tour and to create music together.